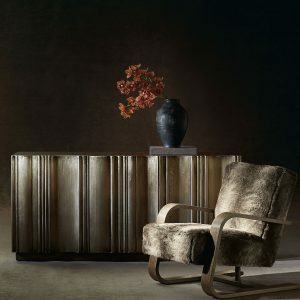 Find the best selection of modern and contemporary cabinets at Katzberry. 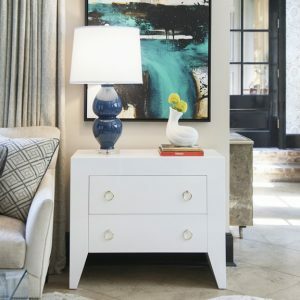 Our online furniture store carries a unique array of cabinets for your bedroom, closet, office, family room, and living room. 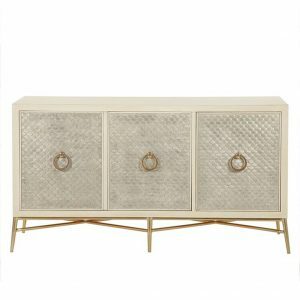 Looking for an elegant yet classy cabinet? 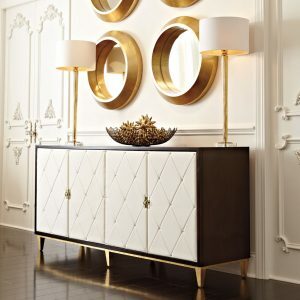 Our Black & Gold Gatsby Cabinet may be a great option for you. 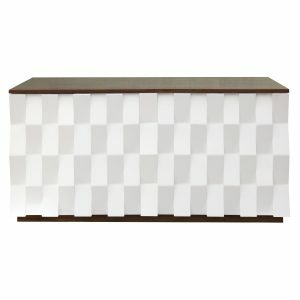 Want something a little more funky for the guest bedroom? 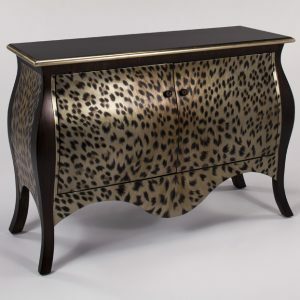 Consider ordering our Black & Leopard Print Cabinet. 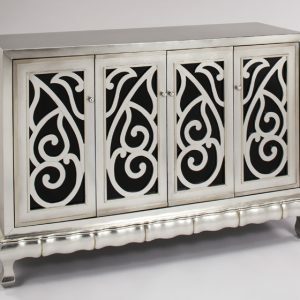 We also carry chests, dressers, and buffet tables as well. 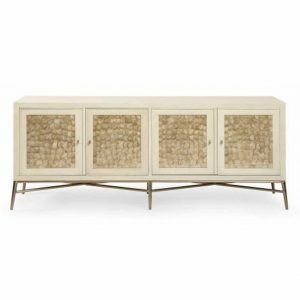 Once you’re done browsing our fine selection of cabinets, be sure to check out our comfortable outdoor furniture, dining room tables, loveseats, media cabinets, and more. 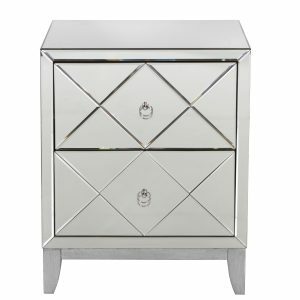 This 4-Drawer Chest has smooth roll out drawers, available in 2 hardware finishes. 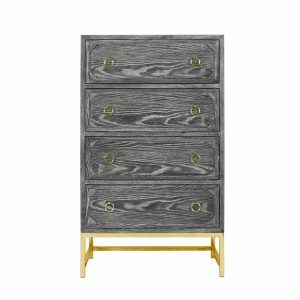 Comes in contemporary Black Cerused Oak. 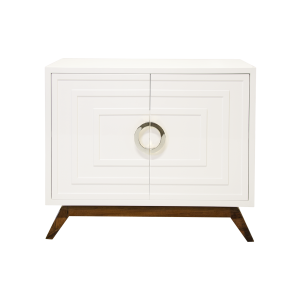 This white lacquer cabinet has two front doors, stained hardwood base and either brass or nickel hardware. 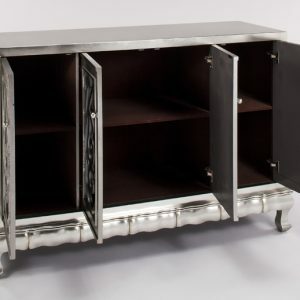 Interior is comprised of one single adjustable shelf with drill outs. 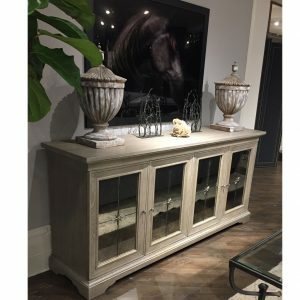 This display cabinet features an arched top and made of weathered sand finish flat cut white oak veneers. 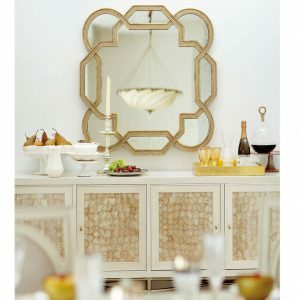 It has two wood-framed doors and curio ends with lightly seeded inset glass. 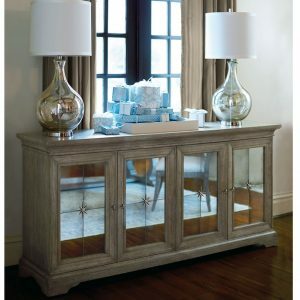 Behind the doors are three wood-framed, adjustable/removable, tempered glass shelves (first, second, fourth). 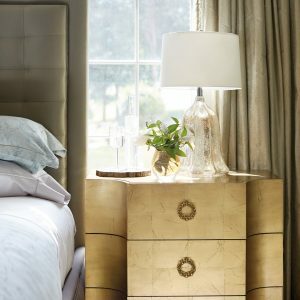 Has an antique mirrored back panel, one halogen light with touch dimmer switch, no plate groves, and Interior adjustable glides. For your safety an anti-tip kit is included with instruction sheet. 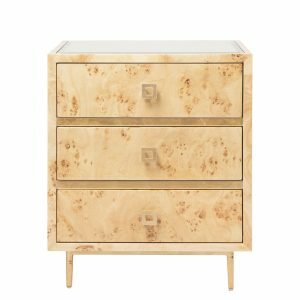 This Burl Wood cabinet has 3 smooth sliding drawers and beautiful burl wood with high gloss finish. 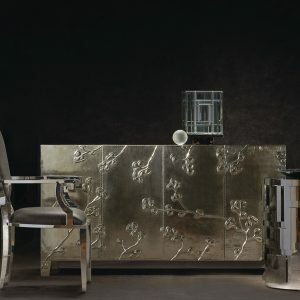 It features gold leaf or silver leaf legs and accents between each drawer, along with gold or silver leaf drawer pulls. 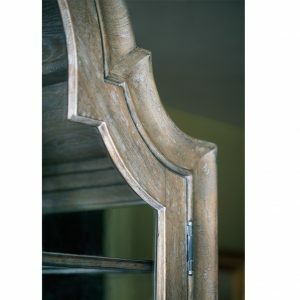 Top of cabinet has a beveled mirror inset. 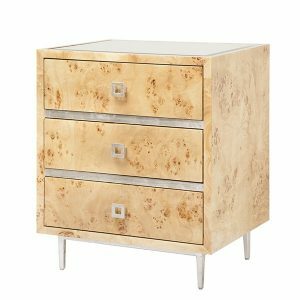 This Burl Wood side cabinet has 3 smooth sliding drawers and beautiful burl wood with high gloss finish. 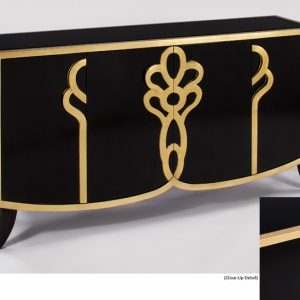 It features gold leaf or silver leaf legs and accents between each drawer, along with gold or silver leaf drawer pulls. 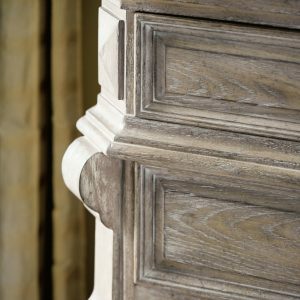 Top of cabinet has a beveled mirror inset. 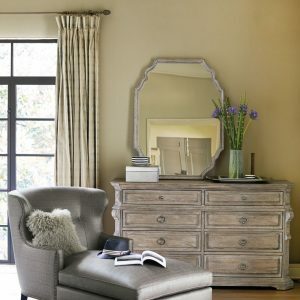 This dresser is made of Flat Cut White Oak veneers and has a Weathered Sand finish. 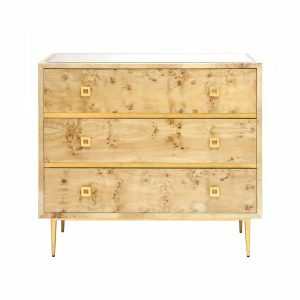 It has two top, smooth open drawers and six deeper drawers under. 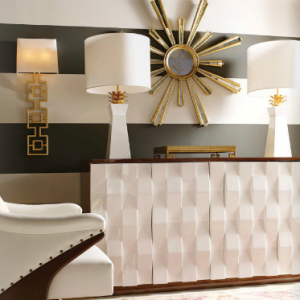 Has adjustable glides and center support leg. For your safety an ant-tip kit is included with instruction sheet. 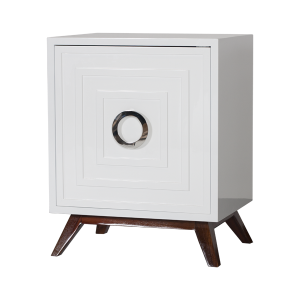 This white lacquer cabinet has one side open front door, stained hardwood base and Brass or Nickel hardware. 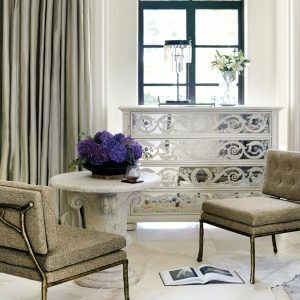 Interior is comprised of one single adjustable shelf with drill outs. 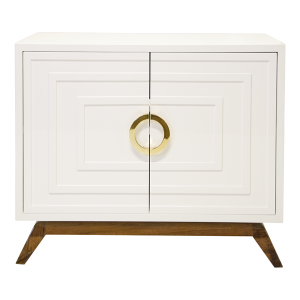 This elegant cabinet has 2 easy roll out drawers and is contemporary with a traditional twist. 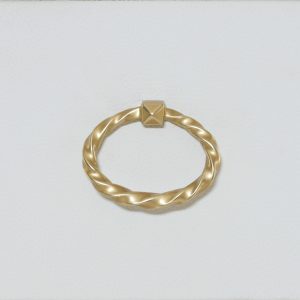 Mirrored on front, sides and top. 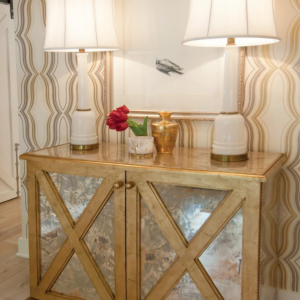 The perfect little statement table. 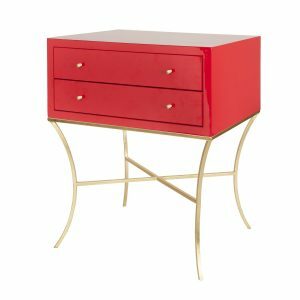 This stunning side table has high gloss lacquer finish with 2 drawers, and either nickel or gold leaf base. 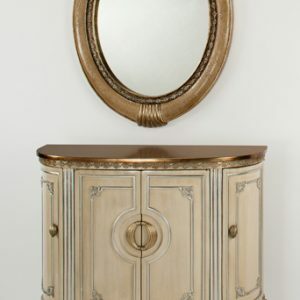 This French styled cabinet is unique and stunning with glamour. 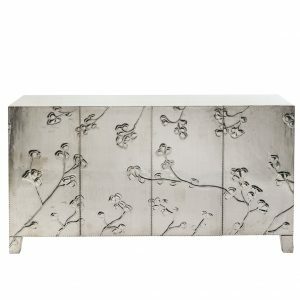 The base has a French Vanilla finish with delicate silver leaf moulding. 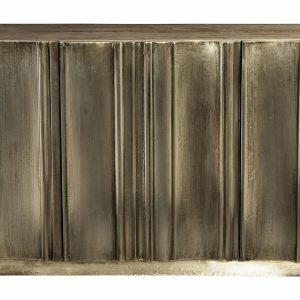 It has raised decorative edging in old world gold and topped with a beautiful antique copper. 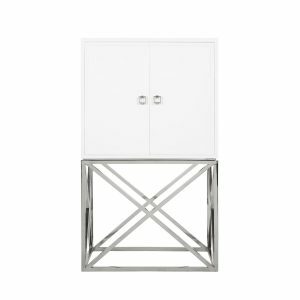 4 doors open to inner storage. 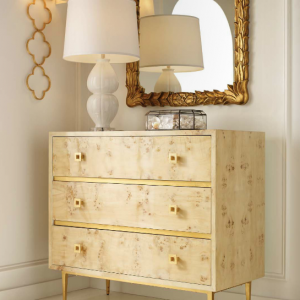 This gorgeous Gold Leaf finish chest is constructed of Maple veneers and has 3 smooth slide drawers. 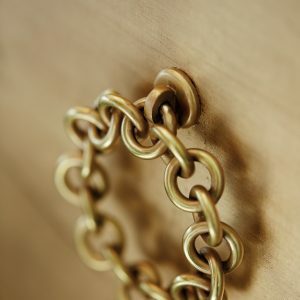 Every detail counts in this chest including its Solid Brass Chain-link drawer pulls. 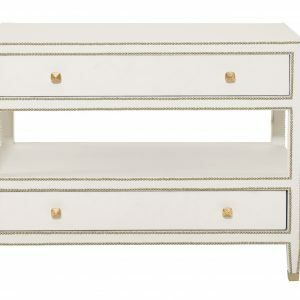 This adorable bachelor’s chest is fully wrapped in White Bonded Leather with Bright Brass nailhead trim. 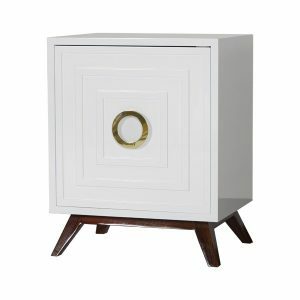 It has one top and one bottom drawer and fully open center. 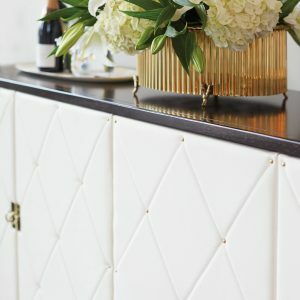 Has brass plated pulls, nailhead’s and ferrules on legs. 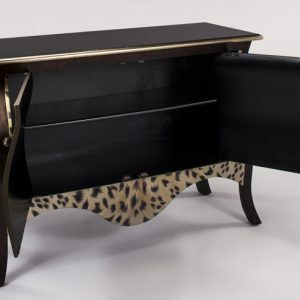 Comes with center leg support, adjustable glides and anti-tip kit. 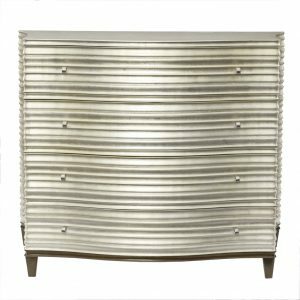 Dresser has ribbon stripe sapele vener in Caviar finish, nine drawers with White Bonded Leather wrapped fronts accented with a gold ribbon swirled brass drawer pull. 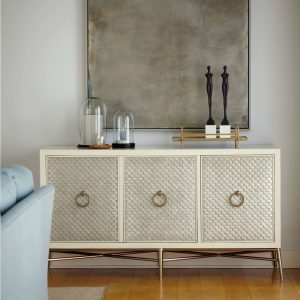 Gorgeous white leather console cabinet, has 4 wrapped doors – quilted in white bonded leather with nailhead. 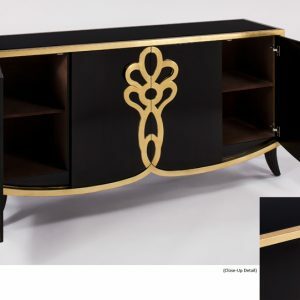 Top and frame has Caviar finish with gold finish base. 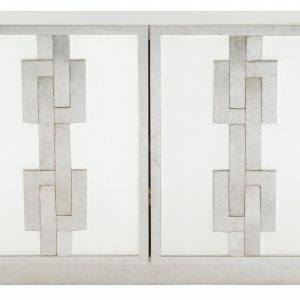 Behind each pair of doors is one adjustable/removable shelf, one fully extendable drawer with hand cut-out and one fixed shelf. 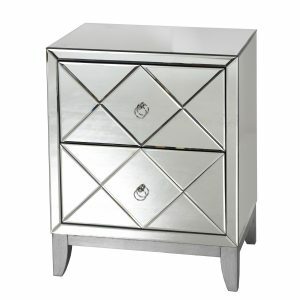 Left drawer has silverware insert, right drawer has wrapped pad. 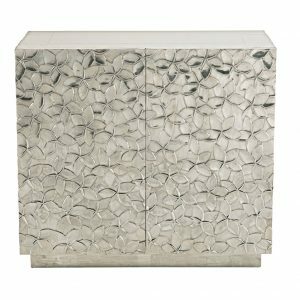 The Mandara Cabinet features German Silver (including back side) with an embossed floral pattern over reclaimed Teak wood. 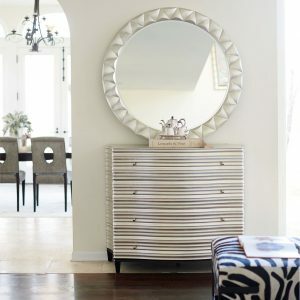 It has two center open doors with self-closing hinges. 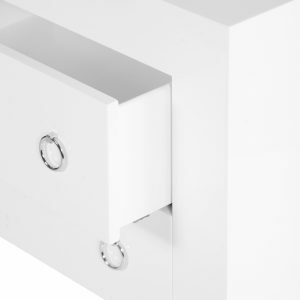 Behind the doors is one adjustable/removable shelf. 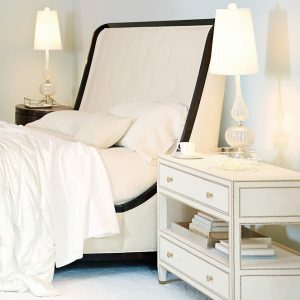 It has Ivory painted interior with adjustable glides and an anti-tip kit. 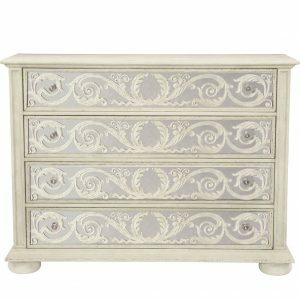 Gorgeous 4-drawer chest has beautiful Silver Sand finish on case with Dark Sable finish on base and legs. 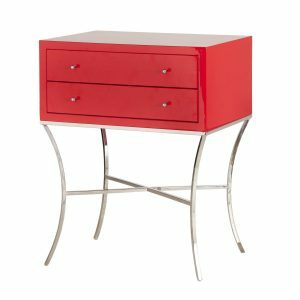 Has 4 fully extendible smooth gliding drawers. 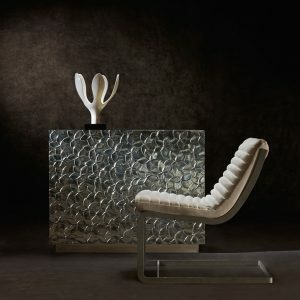 Comes with adjustable glides and anti-tip kit. 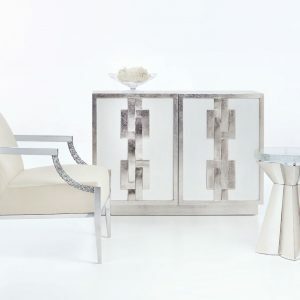 This White Lacquer 2 drawer side table is contemporary in style and beautifully sleek. 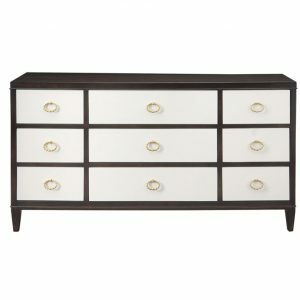 It has a white lacquer finish your choice of either Nickel or Brass pulls. 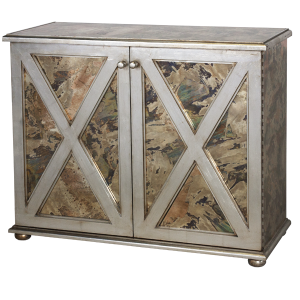 This stylish cabinet features reversed antique mirror crosshatch, behind the X-style Gold Leaf or Silver Leaf trim. 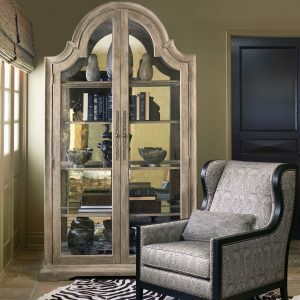 Has 2 swing-open doors and one interior shelf.